He insisted that he was disappointed by the way in which the matter was handled, which resulted in some of the party’s founding members choosing to resign and to form a new party. “If the elections had gone the opposite direction, I would have been there, I know Marlon would have been there working with those persons,” Hon Walwyn said. According to Hon Walwyn, when he joined forces with the NDP in 2011, he was the first candidate to declare himself, “because after looking at the party closer I saw the ideals were good ideals. There were some miss-steps before but the founding principles, the core principal were good,” he said. 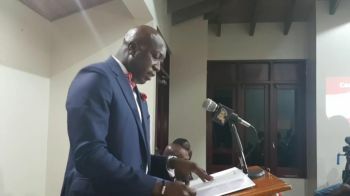 “I came, Honourable Penn came, Honourable Caines [Alvera Maduro-Caines (R6)], Junior Minister for Trade and Promotion Investment came to the NDP when it was at its lowest… we stuck with the party,” asserted Hon Walwyn. 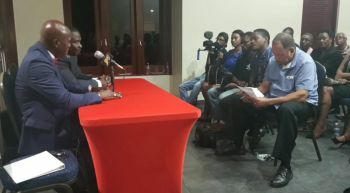 Responding to claims that he said that he cannot protect locals, he said, “those claims are malicious claims from persons who are very scared to meet me at the election polls,” Hon Walwyn uttered. He noted that the NDP has done a lot of good things, “I only hear people pick out three or four things and use that to define the record. That is not true… When you are judging somebody… you write down the bad and the good. When the bad outweigh the good you in problems." “I can tell you today … we have done far more good,” Hon Walwyn noted. On the party's facebook page, the NDP boasts of increasing minimum wage from $4 to $6 per hour in 2016, however, over its rule, the the party been accused of lacking principles, transparency and accountability in governance, with a number of high-profile scandals under its hat. 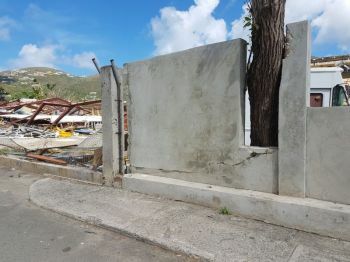 One such scandal includes the 1.6M poorly constructed ‘small wall’ commissioned for the Elmore Stoutt High School (ESHS) by Hon Walwyn through a no-bid contract. Then, the same company, SA Architect, was again given another no-bid contract for the sum of $132,142.45, for restoration works on the ESHS L shaped building. It ain't about talking it's about working and accomplishing what needs to be done for the people. Shereen is a worker and gets things done. Girl dont entertain them with their nonsense bashing one another. I know you will come with facts and solutions. @ wowww, wrong, a who,e group of us want PVIM. Somebody vex because nobody who really understands what’s going on wants you to be the chairman! Dictator! All those fancy words mean nothing if your intentions are for YOURSELF, just look at your at large candidates, all who can be controlled by you! Yet, you want to make others look bad. Too pompous. Majority of this HATE on the blogging comes from your camp and pretty sure some VIP, so don’t try to look like the HERO now bout New NDP! STUPES, All Parties are basically new with some old, LET THE PEOPLE DECIDE and stop with the mudslinging. You will reap what you sow. The press is comprised of mostly if not all non-BVIslanders. They are Myron's friends and sympathize with him. They will never ask him the hard questions, especially Zhan, but the time till come when those questions will need to be answered, not to worry. You going right! Mix it up in order to prevent the Territory from going totally under. Unless we are choosing mature candidates who are truly there for country and not self, who are committed to working together to achieve the very best for the people and country mixing it up could be a bigger problem than what we have already. Much thought must go in to our selections. We do not need a house where nothing can get done because they can't agree with each other. WHEN THE LORD WANTED TO DELIVER ISRAEL, HE CHOSE MOSES. MOSES COULD NOT SPEAK WELL. BUT THE LORD CHOSE HIM TO DELIVER HIS PEOPLE. ELOQUENCE IS NOT THE ONLY OR MOST IMPORTANT FACTOR IN THIS NEXT ELECTION. IT WILL BE COMPETENCE, INTEGRITY, FINANCIAL PROWESS AND TRUST. SO TO ALL THOSE COMPARING PLATFORM SPEECHES AND PRESS CONFERENCES, REMEMBER GOD USUALLY WANTS THE PEOPLE WHO HAVE AN IMPERFECTIONSO THAT HE CAN USE THEM AND ALLOW OTHER PEOPLE TO HELP THEM TO BE USED. Israel's Deliverance, Myron has all that. Why mix up GOD in ayo S@!%. When we using God as a buffet @ a party picking out what we like and want to hear. As far as i'm concerned the better man win. question: why the set of them exhibiting this kindergarten behaviour a bunch of he say she say while some of us love the drama; others have a vested interest and concerns in this country: some of we prefer hearing what will be done to move our people; our generation and the country forward into 2040: big men acting like clowns simply to prove a point(and the point is pointless) all of them are directly responsible for the condition of this territory(bad management and poor political leadership)....church out!!! I am tired of hearing Myron trying to fool the people. I have a few questions for Myron. (1) Where was he when the NDP dole out 7 million dollars to start an airline that will never fly. (2) How will the government be refunded with the money. (3) Where was he when the Pier Park wasted over 30 million dollars. They have neglected the people for so many years and are coming NOW as the new NDP. That is a New Dose of Poison. I do hope that the electorates are not blind, deft or dumb to make the mistake this time around as they did some years ago. They should ensure that NONE of them win a seat in the National Assembly. It is time for them to go. Done with the NDP. We are wiser now and his sweet talk will not influence me to vote for the NDP. I cannot wait for next year to vote them out. VIP all the way! NDP has gotten so many chances to prove themselves. Its time for a change of leadership in the BVI, the country is suffering. Where there is no vision the people will perish. Give Andrew Fahie and his leadership team a chance. well all of them are different leaders.